The M1150-M10 scales decoded position into user friendly engineering units. The calibration of unit is extremely simple and does not require any computations. All users have to do is to move ram to two distinct positions and enter the Shut Height corresponding to those positions.The unit computes scaling parameters automatically. The M1150-M10 shut-height monitor, unlike incremental encoder systems, is absolute. Because of the absolute nature of the resolver, the position is retained even during power loss. In addition, it is highly immune to electrical noise interference. Shut-height can drift over a period of time. This unique feature from Autotech generates an alarm output if shut-height falls out of a preset programmed range. M1150-M10 has a provision for monitoring upper and lower shut-height limits. Alarm will be generated if an operator tries to set shutheight outside his programmed range. displays it on the front panel. The position information is continuously compared to two programmable preset limits and the outputs are activated when limit conditions are satisfied. All outputs of the M1150-M10 are optically isolated and the resolver inputs are differential, ensuring extremely reliable operation of the unit even in the harshest of industrial conditions. The M1150-M10 will decode the shaft angle to 1/4096th of a revolution (12 bits) and keep track of multiple revolutions. The Shut Height Monitor also features tachometer and motion detector, fractional scaling, preprogrammed preset value with an external trigger, full decimal point control and 2 channels of position based alarm outputs. 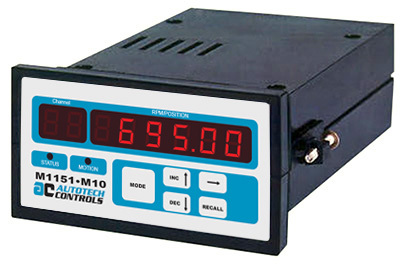 A wide range of easy to set programmable scale factors (0.3 - 4095.999) eliminates the need of mechanical gear trains and prescales the display to readout directly in engineering units. Any preset number can be jammed into the position “counter” by an external signal, thus “offsetting” or “re-zeroing” the machine in no time. As described earlier, scale factor can be automatically calculated for easy calibration of the M1150-M10 shutheight monitor. The M1150-M10 is fully front panel programmable for all variables and yet secure against any unauthorized program changes. Opening of an external user-provided keyswitch inhibits any program changes on the front panel. Nonvolatile EEROM memory retains information indefinitely after power loss or machine shutdown, eliminating batteries and related hazards. The M1150-M10 combines the ruggedness of a brushless resolver and reliability of a solid-state control. The resolver can be mounted on a machine shaft in any hostile environments such as mechanical shock, vibrations, extreme humidity and temperature changes, oil mists, coolants, solvents, etc., and the programmable unit M1150-M10 can be mounted up to 2500 feet away in control panel.